Lately, Sophie May has been watching Abby Cadabby and trying her hand at some wand waving of her own. My daughter is a resourceful little thing, and apparently figured anything long with a rounded end would do. After a rummage through the kitchen utensil drawer, she chose the soup ladle as her improvised wand, much to the horror of her brother, who copped it in the forehead. Ouch. I thought it might be better if she had a softer option. Cameron thought it was a good idea, too. Note! All pattern pieces include a 0.5cm seam allowance. Measure on a piece of paper a pattern piece for your wand. Mine measures 45cm x 5cm. You may want to make it a little shorter so it doesn’t wonk about (we like it that way!!) Round off corners at one end. You’ll need to cut 2 of these, so you’ll need a cotton fabric scrap that will accommodate the size of this pattern piece by two. 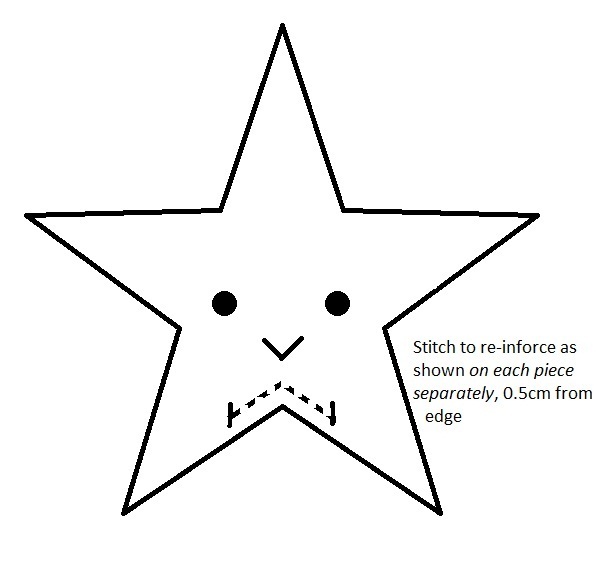 Print off a copy of this rough-as-guts star template (click on image to view full size, then save to your computer and print). You'll need a scrap of about 40cm by 20cm. You may want to use different fabrics for the front and back. You’ll need some wadding – the cheap stuff is fine. 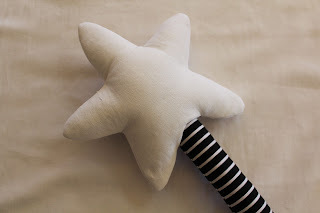 You’ll need to cut two star shapes out of this so it needs to be about 40cm x 20cm as well. Poly-fibre- stuffing – filling-stuff. The fluffy stuff you use to fill your soft toys. I don’t know what it’s called exactly, but you know the stuff I mean. Ribbon for making a decorative bow under the star. A small length of thin ribbon, elastic, bought or home-sewn binding to make a hanging loop, if you want include one. About 7-8cm long. Embroidery floss, safety eyes (or buttons if your child is older), powder blush, etc. 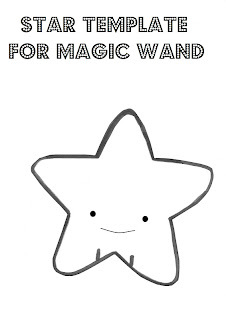 if you want to give your wand a face. A jingle bell or small rattle-box. Which makes for a great effect when bopping someone on the head with your wand. But probably better for older kids, unless you have absolute confidence that your child will not be able to rip your wand apart. Sophie tends to give things a cursory glance and going over before chucking them over her shoulder and moving on to the next thing. Cameron was more a picker and a puller (and still is, at seven). You know your child best, so include (or not) the optional extras that best suit your child. Take the long fabric scrap you’ve chosen for your wand and fold in half. 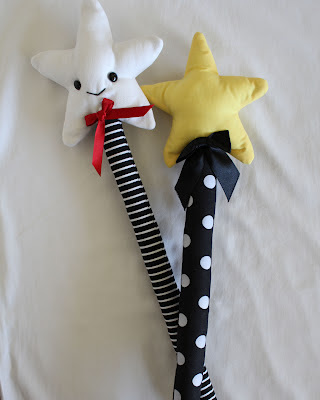 Place your wand pattern piece on fabric, pin and cut out. If you are including a hanging loop, take the ribbon, elastic or binding you’ve chosen, fold in half widthways and baste to centre of the end with the curved corners, on the right side of the fabric. 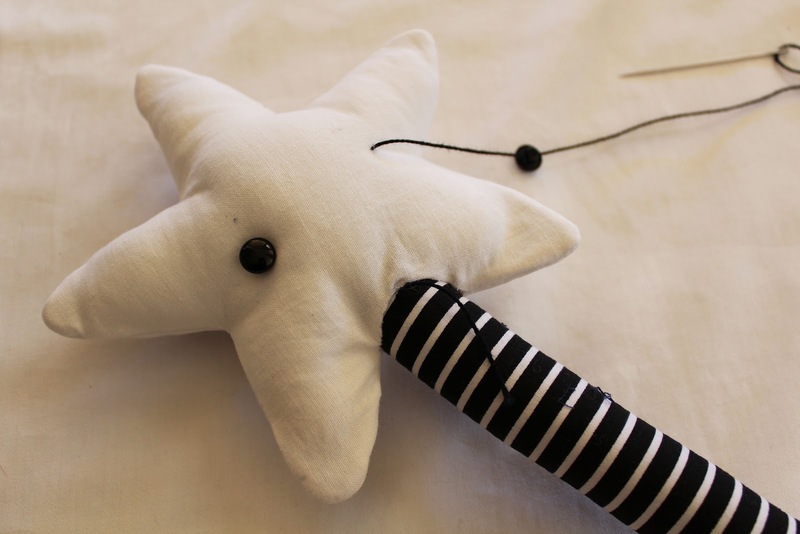 Place the two wand pieces right sides together and stitch down one long side, around the curve end and up the other side. Turn right side out and stuff firmly, using the blunt end of a pencil or something similar to help you cram that stuffing in nice and tight. Once its all stuffed right to the top, run a gathering stitch around the top several times, pulling it tight and closing it off. 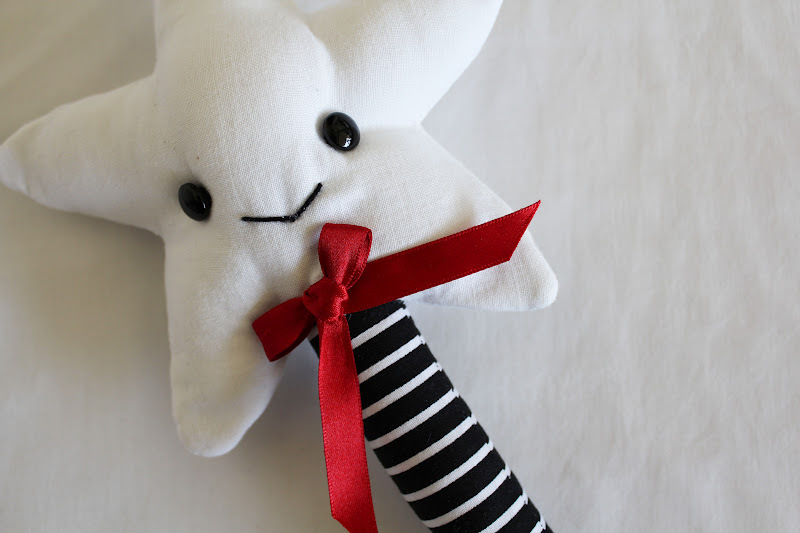 Now, I find it a good idea to reinforce the bottom of the star, where the opening is with stitching, because you will have to clip into that bottom ‘crotch’ point when you push your star onto the wand. If you don’t clip it, the crotch will be rounded and look a bit weird. 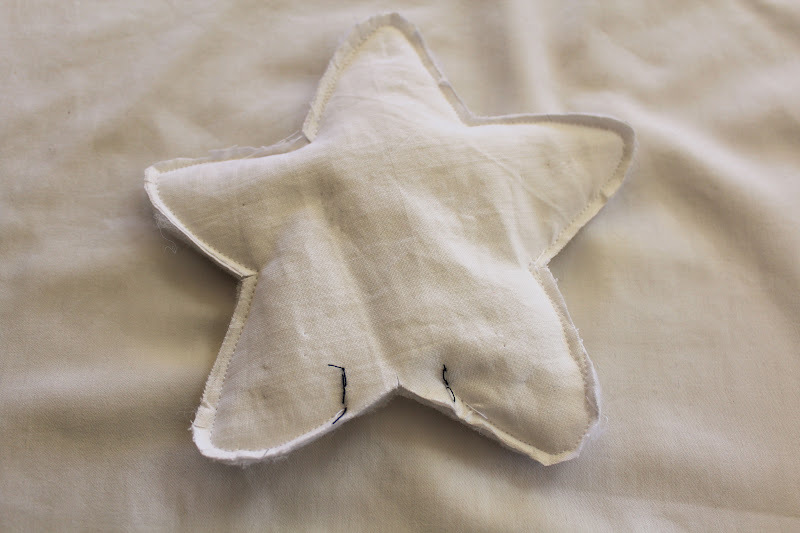 Take each star piece separately and within the bit you’ve marked as the opening, straight stitch along the edge, and into that corner, remembering the 0.5cm seam allowance. Sorry for the dodgy diagram, I forgot to photograph this! Fold your wadding in half so that it is a double layer. 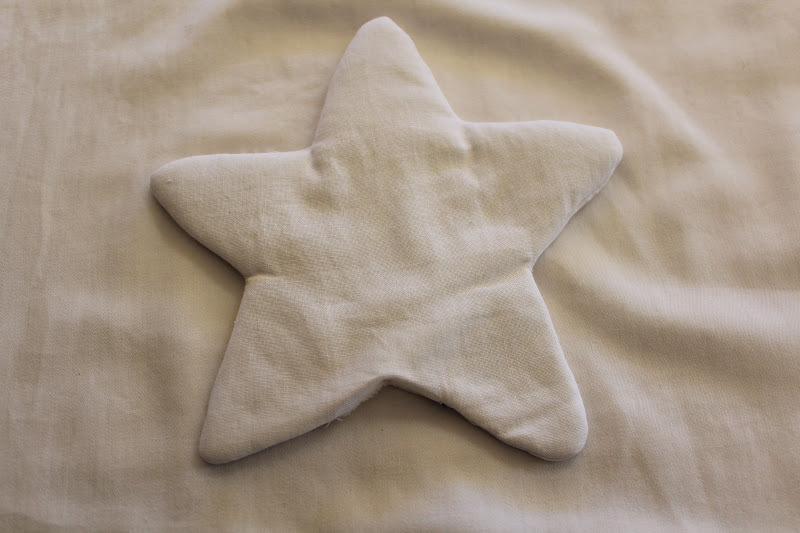 Place your star pieces right sides together, making sure those re-inforced bottoms are together, and pin the fabric star shapes onto the wadding. With fabric star shapes uppermost and the two layers of wadding at the bottom, stitch around your star using the 0.5cm seam allowance (you will have to use the edge of your sewing machine foot as a guide, because the wadding will be covering your machine’s seam allowance guide), remembering to leave the marked opening unsewn. Remember the stars points are not pointy, but rounded. Rounded points (I know – oxy-moronic!) will shape nicer on turning. Once stitched, trim the wadding back as far as you can along the seam lines without cutting your fabric, clip around curves and clip into corners. 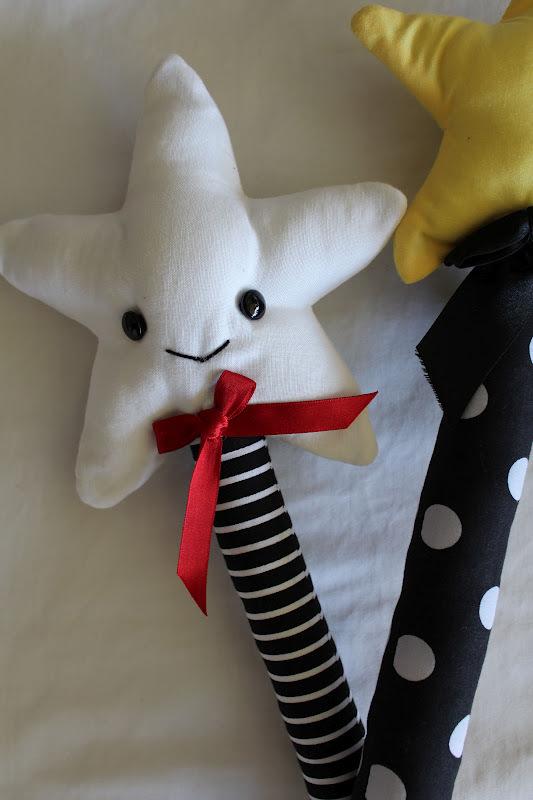 Turn your star shape carefully, starting with one of the star’s bottom arms, and carrying one one arm at a time until they are all turned. Gently poke the wrong end of a pencil into each arm to make sure they are fully turned out. Put a bit of stuffing into the arms of your star, and its body to round it out a bit, but don’t fill too firmly. Put your jingle bell or rattler in their if your using one making sure to pop it withing some stuffing so it can’t be felt too much through the fabric. Clip into the corner of the reinforcement stitching you made into the bottom of your star carefully,. 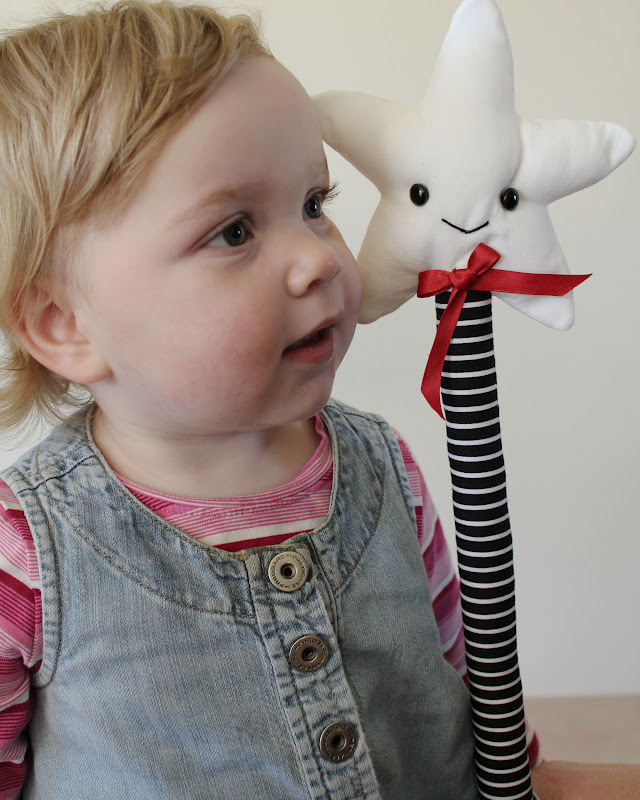 Insert the wand piece into the star piece (there is no delicate way of doing this, just jam and screw! ), and fold those seam allowances in to form a nice angle. Pin them in until your pleased with how that bottom looks and stitch the star to the wand using a blind stitch (go around several times to make sure its on nice and firm). If you are using buttons for eyes, you can sew them on now. Thread a large needle with strong thread, and take it through where the base of the star meets the wand at centre front and out through the star in the position you want the first eye attached. 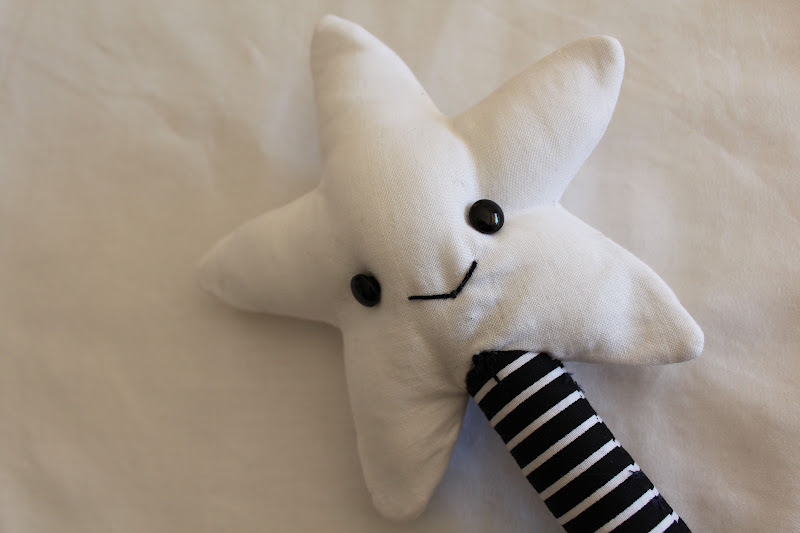 Thread your button on, then re-insert the needle under the button through the star and pull out in the position you want the second eye. Pull slightly to indent the buttons, and take the needle through the buttons and the fabric back and forth a couple of times, so that eyes are secure. 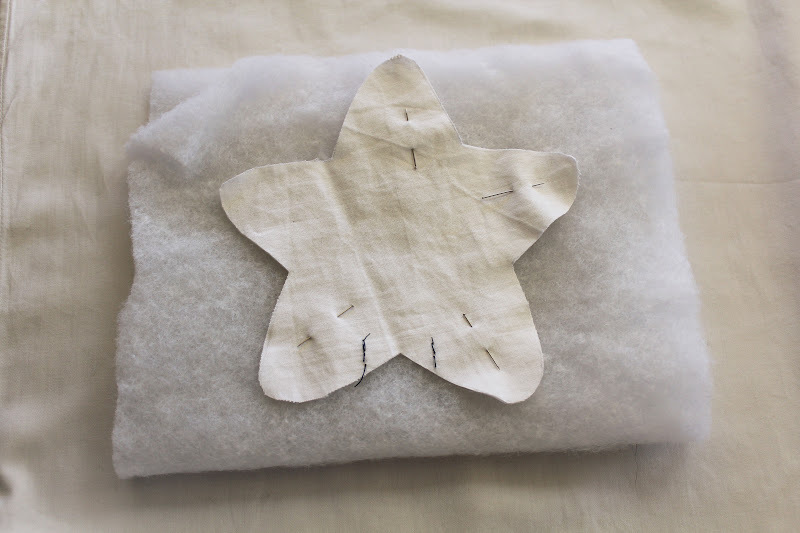 Bring needle out through the star's base where you started, oversew a couple of times to secure, and snip thread off. And look, my advanced embroidery skills come to the fore again in the form of a wide, shallow fly stitch for the mouth! That's about as hard as it gets for me! Make a bow with your ribbon and stitch it on at the join. That will help cover up those bits of thread that went through there when the eyes were sewn on. And it looks pretty! 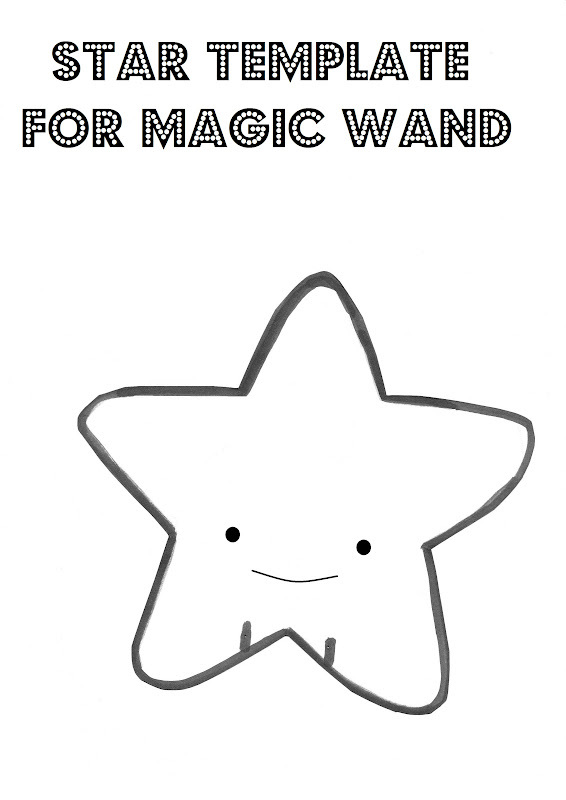 If your wand has a face you may want to put some blush on its cheeks. 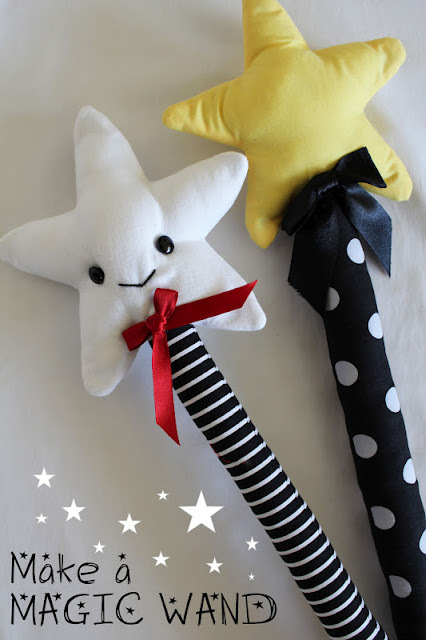 If the wand is intended for an older child, you could pretty it up with some sequins or beads (perhaps they could help with the decorating). Or you could tuck five or six lengths of thin colourful ribbon into the star before stitching it to the end of the wand, to create a magic trail when it’s waved. All done. And much softer than a soup ladle. Time for the bashings magic to begin! Have a safe and magical weekend! How SWEET! :) I just saw this on Craft Gossip and had to come over and tell ya, this is GREAT! :) Good Work! I'm a new follower! I love it! Definitely will be trying this out! The little kawaii face is precious! Thanks, Kat! I have to admit, I am a bit of a kawaii addict! Such a lovely tutorial, I know a little girl who'd love one of these. by the way, I tried to pin this and got the message that other pinners had reported this as spam?!? did you know? Thanks, Wendy, for letting me know about the issue with Pinterest. I've logged the problem with their support department - I hope it doesn't take too long to sort out. I've noticed that quite a few sites I've tried to visit through Pinterest have been blocked of late - seems like a rogue blocker is doing the rounds! I'm quite sure there is nothing inappropriate on my site - I try to keep it family friendly! Cheers again! This... I can do! Thanks for sharing!